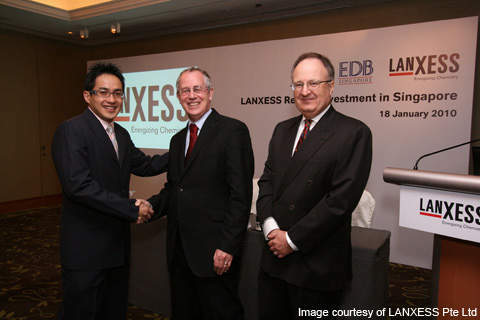 Senior executives from the Singapore Economic Development Board and LANXESS announced plans of constructing a butyl rubber plant in Singapore. 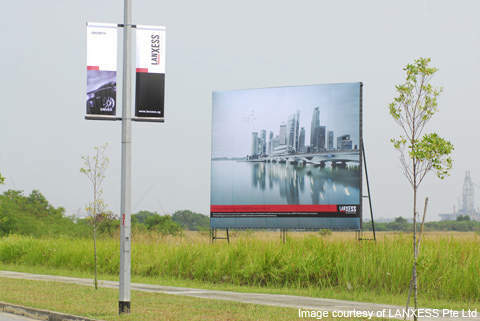 LANXESS' site on Jurong Island where the company's new butyl rubber plant was built. 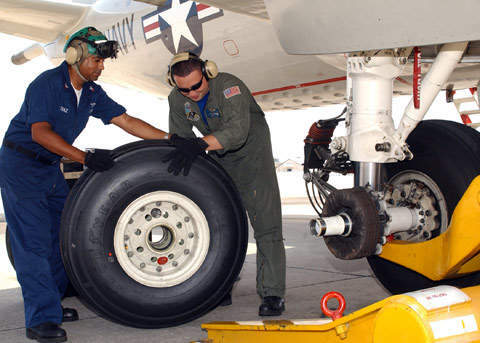 The applications of halobutyl rubber include aeroplane tyre inner liners and inner tubes. On 18 January 2010, Germany-based speciality chemicals group LANXESS announced plans of constructing a butyl rubber plant on Jurong Island in Singapore. The plant has a capacity of 100,000t per year and produces regular butyl and halobutyl rubbers. Construction of Lanxess Butyl Rubber Facility began in May 2010 and the new plant commenced operations in June 2013. LANXESS spent approximately €400m ($575m) on construction. Halobutyl rubber provides comfortable and fuel-efficient automotive transportation. Its applications include inner liners and tubes for trucks, buses, cars and aeroplane tyres. The regular butyl is used both for tyre tubes and sports balls. In addition, the rubber is used for special applications such as protective clothing, curing bladders for tyres, body mounts, sound damping, adhesives and sealants, as well as pharmaceutical stoppers. In addition, butyl rubber has a niche market in the chewing gum industry. The LANXESS butyl rubber plant was built on a 200,000m² area of land, which was leased from the JTC Corporation, an authorised agent of the Singapore Ministry for Trade and Industry. "Halobutyl rubber provides fuel-efficient automotive transportation." The Jurong Island is a hub of petrochemical and chemical companies. It has an ultramodern infrastructure, which supports the LANXESS facility. The plant has around 5,000 control circuits and a 40km pipeline was laid for operations. Its construction required around 200 engineers and created jobs for nearly 1,500 workers during peak times. LANXESS spent approximately 10%-15% of the total project costs on environmental protection technology of the facility. The plant has energy-efficient solutions such as waste heat recovery to save CO2, a treatment plant for the reduction of wastewater by 50% through internal recycling streams and other complex chemical infrastructure. LANXESS butyl rubber is a copolymer of isobutylene and has a small component of isoprene. The butyl rubber is produced by the polymerisation of 92% isobutylene and 8% isoprene at -100°C. The rubber reacts with hexane to produce halobutyl rubber through the process of halogenation. "LANXESS spent 10-15% of project costs on environmental protection technology." The isoprene in the halobutyl rubber creates double bonds and allows the vulcanisation process with sulphur and other agents. This process makes it suitable for different rubber products. The butyl rubber has a good resistance against ozone, weathering and hot air. It is also resistant towards basic and acidic chemicals and has very low-permeability to liquids and gases, as well as good rheological properties. The key raw material for the rubber plant is isobutylene. The feedstock for the butyl rubber is supplied by the neighbouring Shell Eastern Petrochemicals Complex under a long-term agreement made with LANXESS. The Shell petrochemical refinery in Pulau Bukom has an 800,000t a year ethylene cracker. In June 2008 LANXESS awarded a contract to Jacobs Engineering for providing pre-project planning, the plant’s design and front-end loading services to the butyl rubber manufacturing facility. The project team prepared a bid package for the tender process for project execution. The contracts were then awarded after the evaluation of the market, considering several engineering companies including Jacobs Engineering Singapore. In 2009 LANXESS collaborated with the University of Bonn, the Technical University of Dortmund, Bayer Technology Services and special technology equipment manufacturer Buss-SMS-Canzler to develop an advanced technology for synthetic rubber production. "The butyl rubber market is expected to grow by about 3% annually across the world." The technology was developed in three years and implemented in the rubber manufacturing process at the butyl rubber facility in Singapore. The investment for the development of the technology is about €10m and 50% was funded by the German Federal Ministry of Education and Research. The technology is more environmentally friendly and energy-efficient than traditional processes and is also used for the production of other synthetic rubbers, including polybutadiene products. In 2009, LANXESS delayed the plant’s construction until 2014 due to unpredictable customer ordering in the economic downturn. However, demand has stabilised and the market is expected to grow by about 3% annually worldwide due to an increase in vehicle production and growth in the pharmaceutical industry. LANXESS has therefore decided to go ahead and start plant construction in 2010. Halobutyl and butyl rubbers have a good market in south-east Asian regions where around 50% of the company’s production is supplied to China, India and South Korea. The main office of the butyl rubber business unit of LANXESS was moved to Singapore from Fribourg, Switzerland, in order to meet the demand in Asia.